PA Parenteau is coming off the best season of his NHL career. Looking for a solid start in the shortened 2012-13 campaign, Parenteau wasted no time getting into the points column. On Jan. 22, Parenteau proved to be too quick for Los Angeles Kings goaltender Jonathan Quick as he scored a goal in the Avalanche’s first home game of the year. He scored his first tally of the season midway through the third period, as he found the back of the net off a pass from Erik Johnson and sealed a 3-1 win for Colorado. Continuing to add to his stats sheet, Parenteau lit the lamp in each of Colorado’s first four home games, becoming the first Avs player to do so since Peter Forsberg and Chris Drury both accomplished the feat during the 2000-01 season. Parenteau’s scoring ability never slowed as he averaged 0.896 points per game – setting a new career high – and ended the season with the team lead in goals (18) and tied for lead in points (43) with Matt Duchene. He also set a number of other team highs during the year, as he led the Avalanche in games played (48-tied), power-play goals (6), power-play points (13) and shooting percentage (17.1). 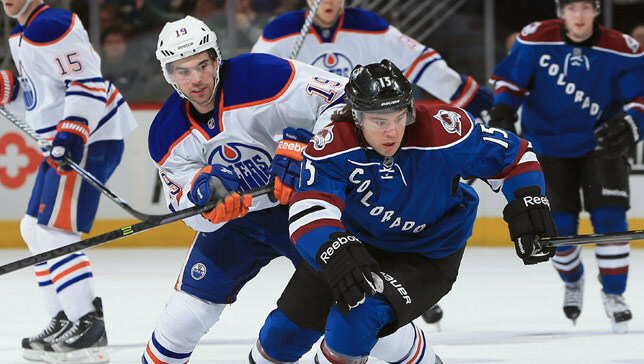 “First off, the guys made it pretty easy on me,” Parenteau said during the season. “My teammates were great when I got here, same with the coaching staff. It was a good fit in Denver, I love the city. Playing with Matt Duchene and Jamie McGinn didn’t hurt either." NHL players didn’t have many chances for rest during the condensed season, but Parenteau never let the stress affect his game. During the year, he compiled a six-game point streak from Feb. 28 to March 10 (2g/8a) and had a team-high 18 points during the 15 games the club played in March. Parenteau’s 18 points set a personal career high for the most points in a single month, and he tied his career-high of three points in a single game twice during the season. Parenteau reached a couple of personal milestones during the season as well. He appeared in his 200th NHL game on Feb. 14 and celebrated his 30th birthday with a goal and an assist on March 24 against the Vancouver Canucks. Personal achievements are something to be proud of, but Parenteau knows that in the NHL the game is about more than individual accomplishments.